One of the great joys about being in the wine trade is that amazing feeling you get when a wine takes you totally by surprise. When a wine startles you and excites you then that is certainly a wine worthy of tasting and discussing, which is wonderful when so many wines are rather workaday. So many people drink a narrow range of wines, I have banged on about this before, but it is true. People regularly drink a range of wines made from a tiny range of grape varieties and from a relatively predictable range of places. If you try and get people to drink outside this band, as I frequently do, then you often meet an astonishing amount of resistance. Which is such a shame as so many wonderful, fascinating, great and downright delicious wines are produced elsewhere and from all manner of grapes – including many that are pretty rare and that you may not have tried. Well, the other day I tasted a wonderful and engaging wine from Chile that was very, very different and took my breath away and so I have made it my Wine of the Week. Everywhere you look there are maverick wine producers nowadays. In every wine producing country, as long as you steer clear of the big producers, you quickly discover some passionate soul that is nurturing old, historically unloved vines back into production. It is one of the great stories of our times and one that restores my faith in wine every time I come across it. I have been aware for some time that Chile is part of this movement too, indeed I sometimes lead tastings focussing on this trend in Chile’s vineyards, but it is always worth revisiting. Because Chile has focussed for so long on classic international grape varieties, especially Cabernet Sauvignon and Merlot, it is easy to lose sight of all the other things that are grown in Chile. What’s more as almost no international vines in Chile predate 1978 (there are exceptions to this, of course), it is easy to assume that there are no true old vines in the country. Well there are, they just happen not to be the grapes that Chile has traditionally wanted to sell. They tend to be Carignan, Cinsault, Mourvèdre, Pais and Moscatel / Muscat – all vines that owe their place in Chile to the Spanish colonial past rather than nineteenth century fashion as the international grape varieties do. 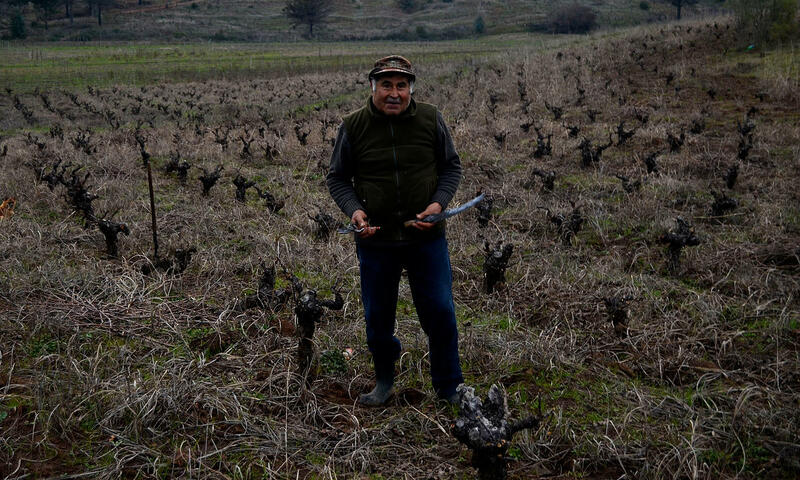 What’s more these vines seem to almost exclusively grow in the tucked away, almost forgotten regions of Chile’s south – Itata, Curicó and Maulé. Unlike the sought after regions further north these areas remain the preserve of small landowners and poor farmers who cannot afford to uproot vines as fashions change. Thank goodness for that too, as if they could Chile might not have these fascinating old vines. The ancient bush vines being tended – photo courtesy of Rogue Vine. This extraordinary wine is a field blend of 95% Cinsault and 5% País, so it really is a nod to winemaking of the past. Back before we all got technical, grape growers had no idea what they grew – vines all had local names and often still do – and so were just picked together and fermented together. That is a field blend, as opposed to the more modern and normal method of fermenting each grape variety and block or site separately, ageing it and then blending the wine. The vines grow as free standing bushes – bush vines – and are unirrigated (it is cold and wet down here, so irrigation is not needed) and ungrafted, so grow on their own roots. The aim was to make something special out of these wonderful vines which prior to the project had just been used to make very basic table wine. Winemaker Leonardo Erazo Lynch is a Chilean who has already developed a similar project in South Africa‘s Swartland region, a region that was similarly left behind by fashion. Leonardo keeps to the old ways, using old vines – it seems these are between 60 and 300 years old – organic viticulture, wild yeast fermentations and ageing in old (neutral) barrels. Straight away this wine seemed like an old friend, the nose was enticing, rich and aromatic with herbs, spices and a gamey, mineral, savoury thing going on, as well as a feeling of freshness and an interesting touch of something medicinal – like iodine – which sounds nasty, but is actually rather nice. The fruit was decidedly red, with cherry and raspberry notes. The palate is medium bodied, but with loads of flavour and soft, light tannins. The red fruit comes through on the palate together with some earthy and mineral characters as well as a fragile savoury note that gives it something of an old world feel. The finish is long and the whole thing feels very fine and complex, which is helped by some nice fresh acidity. If you like Burgundy or Rhône wines then you will certainly enjoy this – 92/100 points. Available in the UK from Honest Grapes and Selfridges for £17-£20 per bottle. For further details contact Indigo Wines. I would drink this with a casserole, pie or cassoulet if I was feeling adventurous. It would also go very well with duck,, Shepherd’s Pie and all manner of hearty, warming winter fare. In summer it would be lovely lightly chilled with charcuterie.